You met Your Person and the thought of marriage makes your heart go all pitter-patter. You can daydream about it all day, but now? You’re inundated with tasks and to-dos that are never-ending — from finding the perfect photog, to selecting juuust the right shade of napkins, it’s the opposite of dreamy. You want someone to take a big bite off your plate. (Metaphorically. I would never.) You want to be able to sit back, actually enjoy your engagement season, and imagine your final walk-into-the-sunset moment: hand-in-hand with your other half and shiny new vows. Hand off that stress, baggage, task after task to someone who gets it, and can translate on paper exquisitely. Because your story is significant. And deserves lovingly-crafted paper to match. And you're all set. Put on your fav lipstick and dancin' shoes, because you've got a better half to smooch. What are you waiting for? All there's left to do is find that perfect frame. Heirlooms, especially those created so purposefully, deserve to snag a VIP spot on your wall! Need paper for your reception or ceremony? Consider me your all-in-one spot. Let's take care of those, too, and make them delightfully cohesive. Envelopes in the mail and RSVPs rollin' in, you're good to go, sister. Is dotted, Ts crossed? We're in business! With your approval I send everything to production. They'll arrive at your door snug as a bug — with a couple extra surprises. We collaborate one-on-one on up to three digital proofs of your dreamboat of a wedding suite. You receive a custom timeline so you know exactly what to expect (and when to eagerly check your inbox for an email from yours truly). Once you're an official P&H bride, we begin our 8-step design process. Fancy! Once you're an official #paperandhoneybride, we begin our 8-step design process. Fancy! We work back and forth on your custom quote, tailored JUST for your unique wants and needs. No picking blindly out of a catalog here. * friend + vendor, of course! Shoot me a message and start the conversation! You’ll receive a welcome guide full of handy info (so you’ll feel like a pro before we even start) and a new client questionnaire. It's your invitation to brag about yourself and tell me exactly what you're looking for. You think we’re a perfect fit? You want me on your team of friendors*? I’m flattered! Yeah, it's good. Real good. And we couldn't love it more. 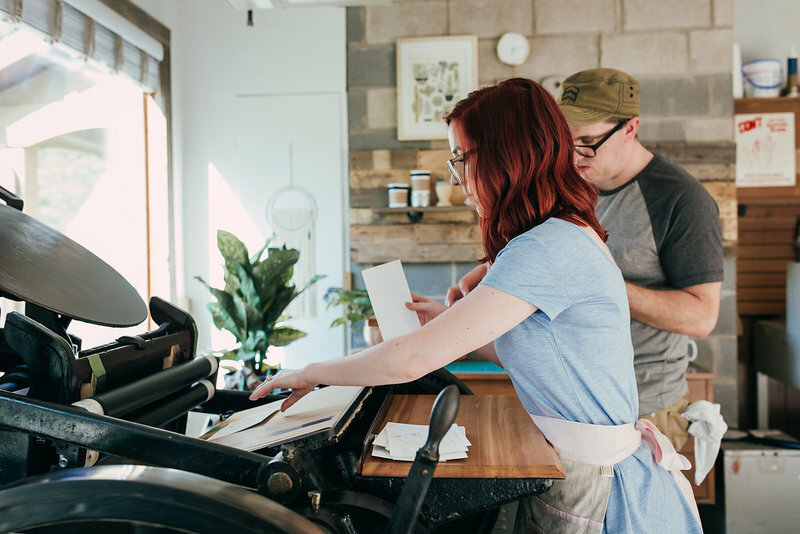 While the first moveable type press was invented in the 1400s, letterpress has survived 600 years as a remarkable and fine printing method. 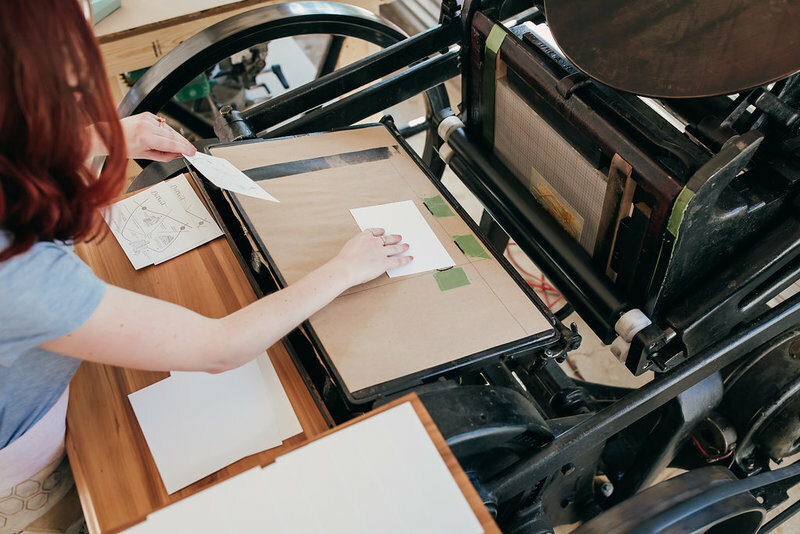 In a constantly evolving digital world, letterpress remains steadfast in its tactile, sincere, and by-hand nature. 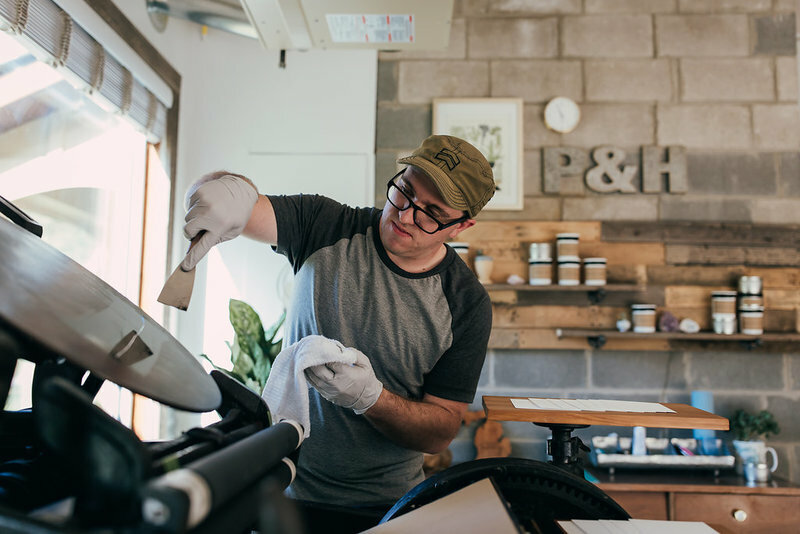 If you're someone who appreciates the fine details, covets authenticity and artisan quality, and sees the value of intentional goods made by hand, you might just be a letterpress lover. And you're in fantastic company. Letterpress: magic in an envelope. 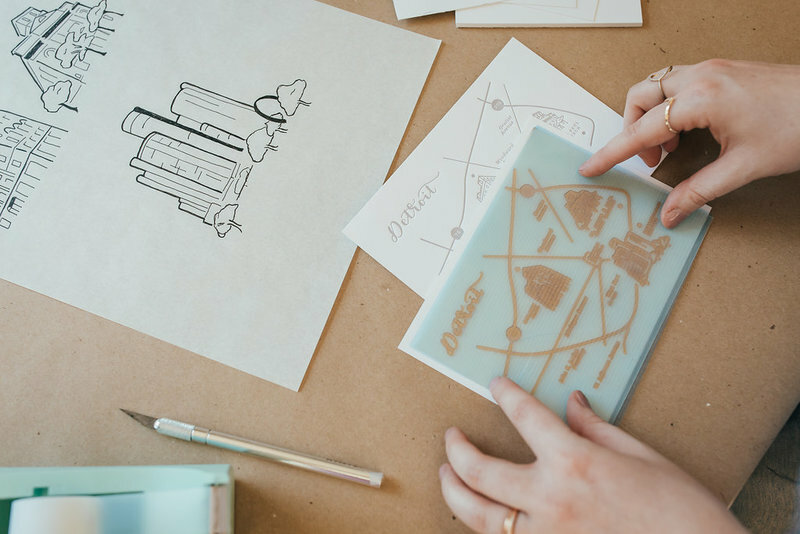 When your suite is completed and we've moved into production mode, your designs are made into custom photopolymer plates. With letterpress, colors are printed one at a time, requiring a different plate and machine set-up per color. Print registration can be described as exactly where your print is placed on each sheet. Because each sheet is printed by hand, accurate registration is essential to provide the heirloom-quality pieces we pride ourselves on. This stage often includes a few test runs to ensure perfection. Once setup is complete, actual printing can begin! Each and every piece is printed by hand. This means each piece of paper is hand fed into the press, then removed once printed. Winnie the press is quicker than you'd expect an antique machine to be, so she keeps us on our toes! Hand printing on a press means each print is delightfully unique, and you'll see subtle yet varying differences among them. We inspect every single print with discerning eyes to ensure they live up to our high standards — and more importantly, worthy of a treasured keepsake. Once printing is completed and Winnie is shiny and clean, we put the finishing touches on your suite and pack it up tight. Like proud and anxious parents sending their firstborn off to college, we say our bittersweet goodbyes once your suite heads out the door... and then party just a little bit thinking of your reaction. The best part. Laura, thank you truly does not suffice. Your work made our wedding feel more special and like 'us.' The invitations are exquisite — I framed one and it currently hangs in our bedroom. Your work truly is one-of-a-kind... never stop doing what you are doing. You made me feel so special, and the finished product was more than I ever could have dreamed. Thank you so much! Working with Laura was a dream come true! I was the definition of an "ultra picky" bride so when it came time to picking our invitations, I knew it had to fit in perfectly with the theme of our wedding. After all, invitations set the tone! Laura's eye for detail and aesthetic was exquisite. We were blown away by how beautiful they came out. She absolutely nailed it. In addition, her personality and kindness matched her beautiful work, and from day one we knew we would have nothing to worry about. Laura is heartwarming, talented, and super hard working. Cannot wait to continue working with her in the future! 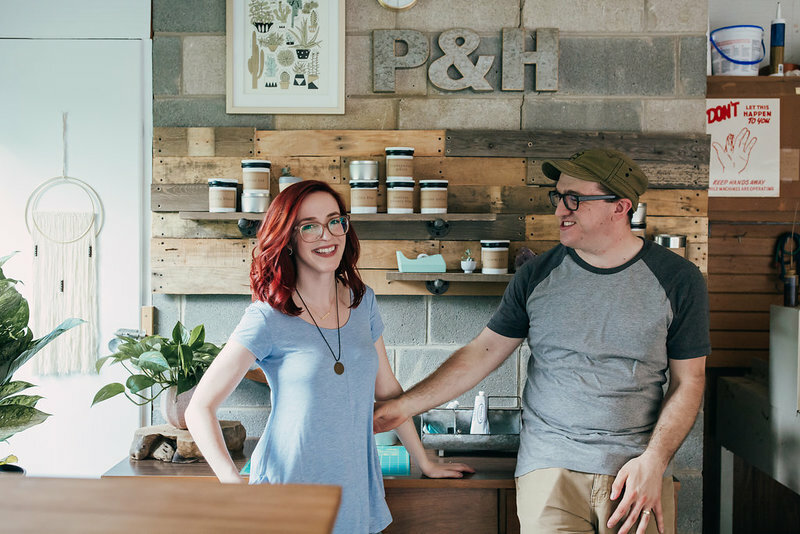 Paper & Honey was so amazing to work with. I was absolutely obsessed with the final product and Laura was very patient in helping me understand what I was looking for was well as consulting me in ideas and ways we could get that accomplished. I really felt like Laura was a true partner to me and paid such attention to detail - which was so valuable. When I received my stationery in the mail it felt like I was getting a present! :) It fit exactly what I envisioned, my entire setting and really helped inject our personalities into our wedding day. Laura, I could not be happier!!! It's perfect and wonderful and I'm jumping for joy! I cannot thank you enough for the beautiful work you did for our wedding. You are seriously such a joy to work with and I cannot tell you how these just seem to make our day complete. Seeing it come to life with everything at the wedding was really something special. You're truly an incredible artist and an amazing woman. I could not have entrusted this with anyone more kind-hearted and loving as you. Thank you thank you thank you! Let’s just say we are nothing short of blown away. I mean, we knew how talented you were, but you really outdid yourself. We are so honored to have partnered with you. I am a firm believer that everything happens for a reason and choosing you to create our stationery has been one of the best decisions we have made throughout this entire wedding planning process. It’s been an absolute pleasure and we couldn't be happier with the end result, they represent us so well! I have told so many friends about how lovely you are and many are swooning over your work. Everything you touch turns to gold — literally. Custom heirloom stationery begins at $1800. Let's make the paper you'll show your grandchildren when you're old, grey, and pulling out your wedding album after all those precious years together. What do you say? Because after all, once the cake is eaten, the flowers wilted, and the memories begin to fade, you’ll only have a few tangible items left to remember them by: photographs, the dress hanging in the back of your closet, and the paper. Better make them count. Don't think of this as paper. Think of this as a bespoke family heirloom. You find joy in the little nitty-gritty details. Wax seals, envelope liners, painted edges? Like a sugar rim on your favorite cocktail, it's the small things that make up the bigger picture. And that picture is just heavenly. You're not after typical — trendy means nothing to you. 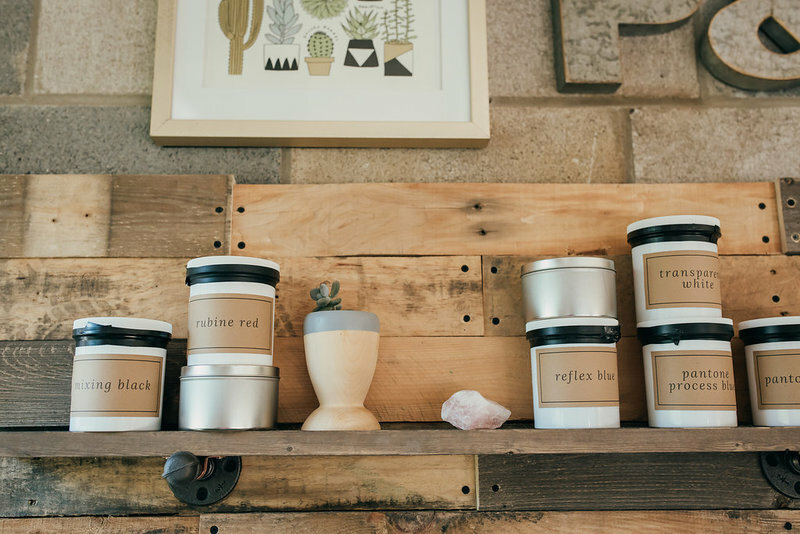 As far as aesthetic's concerned, you pass on what's hot on Pinterest. The good stuff is found in the just-for-you, intimate details — the oak tree you both studied under in college, the pup you rescued together, the song you fell in love to. You're the type to keep meaningful mementos. Like that first concert ticket with your main squeeze — or that stained coaster from the dive bar where you met. Actual treasures. You want a marriage more beautiful than your wedding. And you want a pretty dang dreamy dreamboat wedding. You recognize the pure delight that comes from running your fingertips over a deep letterpress impression. Like that first bite of Chipotle. YUM. yeah, them's good stuff. let's get started. Sounds fab! How do I get started? Will you help me with wording and etiquette? How many invitation sets do I order? How much should I budget for stationery? I love a suite on your site — can I have it? I love a suite on your site—can I have it? How long should I expect everything to take? Will you send me the files so I can print myself? Can you send me physical samples of your work? Click a question below to populate its answer! Absolutely! Sample packs are available for $40. They include multiple suites with a similar aesthetic and printing method of what you’re looking for. If and when you book, those dollars will be credited towards your first invoice, making it essentially free. Awww, yeah — we like free. You will receive up to 3 digital proofs in your inbox. Take special care to ensure all info and spelling is correct! Compile any feedback or edits you have into one email, shoot it off to me, and expect them to be applied to the following proof! Easy peasy. Unless otherwise specified, pricing does not include postage. I always highly recommend taking a completed set to your local USPS post office for an official postage recommendation! I'm happy to recommend my very favorite postage sources — nothing better than a good vintage stamp. Nope! Each custom suite is truly a labor of love, and I like to see it from the beginning concepts all the way to the completed, beautifully printed suite that it evolves into. By printing and inspecting the finished pieces myself I’m able to ensure that it stands up to the quality that you and your guests deserve. 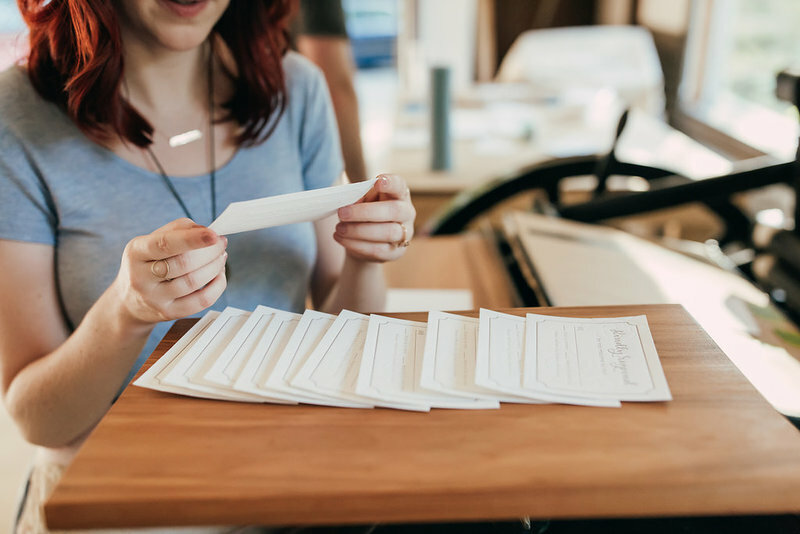 Timelines depend on current availability and have a lot of factors on your final in-hands date, including your printing method and if you’d like calligraphed envelopes. From the date of the first proof to the date you receive everything, you can expect the process to take anywhere from 6-12 weeks. Day-of stationery has a shorter lead time. I'm humbled and honored to work with and serve all couples to the very best of my ability. Everyone has a seat at my table. Love a certain suite as-is and wanna make it yours? Let's do it! Previously designed suites are offered at a discounted rate with limited customizations — we essentially only switch out your information and printing method. We do however have complete freedom over the fun stuff, like colors, envelopes and finishing touches like ribbons, belly bands, wax seals, envelope liners... the list goes on! 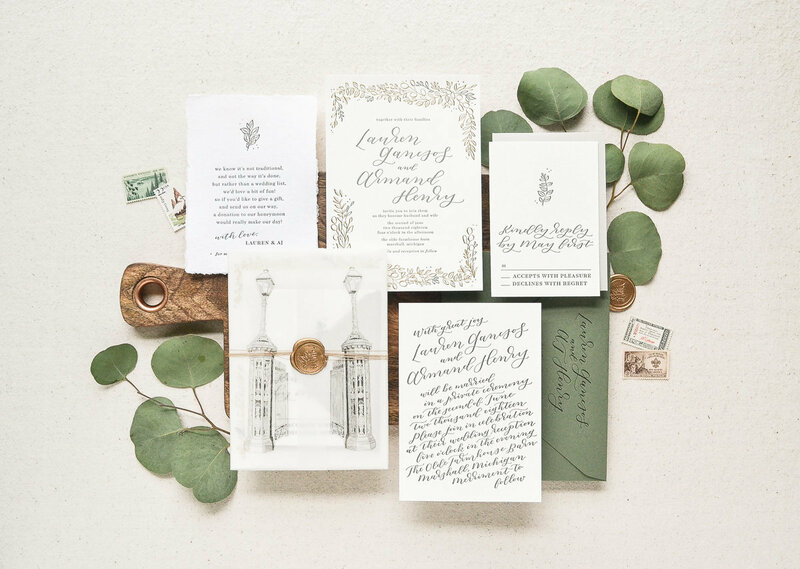 Between save the dates, invitation suites, and day-of stationery, every single wedding is unique. Most Paper & Honey® brides spend between $1500 and $4000 on their invitation suites. Because we price a la carte, we're able to combine any number of options to create your ideal package. Sky's the limit! Remember: only one set is needed per household, not per guest, with the caveat that children over 18 receive their own invitation. Last thing we want is for you to order double! I also ALWAYS recommend ordering extra for keepsakes (I'm all about those keepsakes), photographs, and the inevitable just-in-case-last-minute-guest. Totally! I'm an excellent Right Hand Gal and will help you out every single step of the way. From etiquette, to how to address your envelopes, to distinguishing from informal vs. formal verbiage, you won't be left wondering. I thought you'd never ask. Shoot me a message and let's chat, or go ahead and fill out the wedding questionnaire via the link below. You've got a story to tell and a family heirloom to create — and no time to waste! Let's get started so you can get back to sippin' punny cocktails with your best galpals. "Let's get it started (HA!) Let's get it started in here." — The Black Eyed Peas. Poetry. take me to the wedding questionnaire! I'm ready for my heirloom. take me to the wedding questionnaire! I'M READY FOR MY HEIRLOOM. Ready to work one-on-one with someone who gets it (and wants nothing more than to take some of that stress off your plate)? Ready to dive in and brainstorm on how we can make YOUR invitation suite unlike everything else that's floating around the internet? Ready to create a keepsake that's right up there with your grandmother's pearls? I thought so. And I couldn't look forward to it more.